The X-men and Generation-X are playing a friendly baseball match. Just as things get out of hand Colossus and Callisto teleport in. The X-men quickly rush Callisto to the infirmary where she warns Storm and the X-men that the next generation of Morlocks will be staging a “reenactment” of the Mutant Massacre all those years ago but using humans and it will be up to the X-men to stop them. She also warns them not to underestimate them as their previous attacks (see Generation X # 5 and #6 and Uncanny X-men #323 and #324) were simply tests. They jet to the tunnels where the Gene Nation leader Marrow has taken a train full of people hostage. 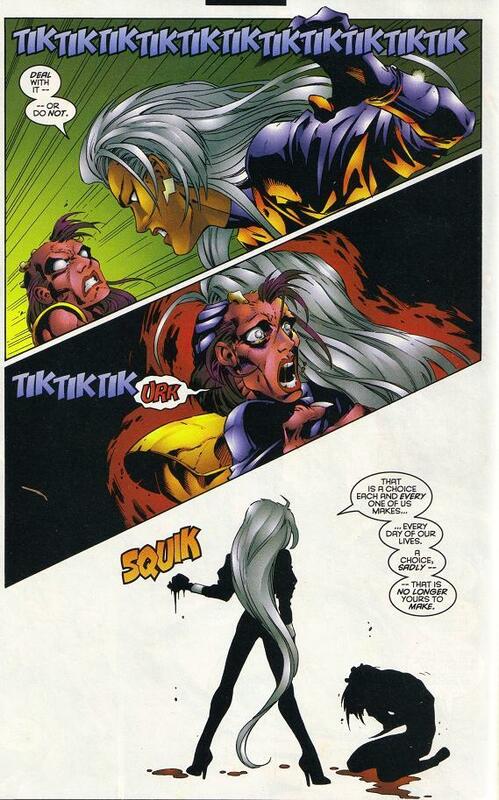 Storm and Callisto exchange barbs before the team is attacked. Storm alone is left to face Marrow in single combat. To make matters worse she has attached a bomb to her heart and only if Storm kills her can she save the innocent people. The fight is fierce but in the end storm rips her heart out thus ending her life and the threat to the innocents. Art-The art of Joe Maduera is beautiful, hands down some of the best art you will ever see in comics, sure it has a Anime feel but it just looks damn good! Pain-The dialogue between Marrow and Storm was good stuff, marrow had quite a few good points too, Storm was a lousy leader for the morlocks and they did not benefit in anyway from her being leader! The words and art also meld together very well to illustrate her absolute bitterness toward Storm. You can hear and smell the choked back tears and bile as Marrow rips into Storm so much deeper than the cut of any knife. It’s the greatest strength of this issue the execution of Marrow’s motivation. How she perceived Storm as a child and how her experience has made her into this….bitter young woman. Kudos to Scott Lobell! Conflict- This fight particularly strikes Storm deeply since she knows she let the morlocks down big time! Storm in a very literal way “created” Marrow through her lousy leadership and the panels where she rips out the girls heart has far reaching ramifications for Storm. Yes she wanted and needed to save the “innocents” as Xavier calls them BUT in saving them she had already FAILED to save the entire morlock race and the new generation. This fight and the conflicts which lead to it points out the deficiency in Storms leadership. Nowadays It’s common place for deaths to happen in copious amounts BUT back in the day Storm despite being a more caring “motherly” leader had all kinds of bad things happen to her team; The morlock Massacre found the X-men severely injured, Colossus, Nightcrawler and Shadowcat while the Morlocks were decimated. Storm is a capable leader BUT she is NOT the best leader. Sometimes leading with your heart and not your head is a recipe for disaster. The fight between Marrow and storm was well choreographed! That samurai/Anime swipe they did to this day is EPIC! Rivalry-Marrow and Storm have excellent chemistry and this issue introduces many of the issues that make them such a unique pairing. She represents Storm’s failure as leader of the Morlocks, all the neglect etc she literally is all the Storm related Morlock failure given form. Black Heroes- The opening ball game has Monet and Bishop while Storm is the star of the show. That’s a pretty sweet deal right there! Cover art-fold out poster with the foil x-men symbol was gorgeous! The story was a bit contrived…….some parts felt forced…seriously and apart from Marrow’s fight with storm everything else was dealt with off screen, even the question of what happened to Marrow’s body? Reverbs? or even the poor man mangled by his bicycle? The X-men just waltz out of the tunnels with little to no resolution….. I mean why rip out her heart and have her body disappear? Besides the obvious “She’s not dead” comic resurrection! Threat- Ok so for this little crossover Emma Frost was attacked by Gene nation who managed to capture her and kill a bunch of people. In Uncanny a disco worth of people were slaughtered and the X-men including Storm, Wolverine and Cannonball had to give their all to defeat two members. This issue all are gathered but can’t come up with a sufficient threat to battle the X-men? Every fight besides Storm vs Marrow was handled off panel. The fact that the other members could be defeated in the few minutes it took Storm to dispatch Marrow was disappointing. Besides Marrow the rest of Gene Nation did not seem up to the task at hand.